Riverbed 201-01 exam is for RCSA – NPM Riverbed Certified Solutions Associate – Network Performance Management Certification, which is designed to validate the skills required of pre-sales engineers and technical professionals who can demonstrate knowledge in the theory and configuration of Riverbed SteelCentral solutions, and to be able to conduct demos and proof of concepts (POCs) in a customer network. If preparing for 201-01 exam, I suggest you choose Riverbed RCSA – NPM 201-01 Dumps as preparation materials. 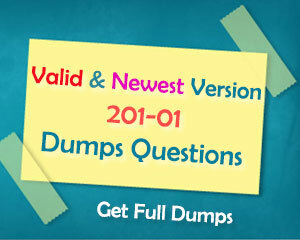 Before choosing Riverbed RCSA – NPM 201-01 Dumps, just read free 201-01 dumps to find why to choose. B. Right-click the View item and select "Apply with Filter". 3. Which of the following supports the largest number of Cascade analytics? 4. How do you configure a new user for the Cascade Shark appliance? A. Select a graphic object in a View chart, and drag a View on the object. B. Select a graphic object in a View chart, and drag a View on the trace file. C. Select the View, right-click, and apply it with the filter associated with a graphic object. D. Right-click in the View chart, and select "Drill-down" to select the View. 6. What are the default credentials to log into the Cascade Shark appliance Web Interface? 8. In the Cascade Profiler GUI, what do the QoS values mean? A. They are based upon the 6-bit Differentiated Services Code Point (DSCP). 11. How many Host Group Types can you define within Cascade Profiler? 12. Which Cascade product runs under Riverbed Service Platform (RSP)? A. The company must buy a new Standard Cascade Profiler and stop using their Express. B. The company can continue to use their Express but must buy a new Cascade Profiler. C. The Express can be further licensed to capture the currently dropped flows. D. The company must buy a new Standard Cascade Profiler but can use the Express functioning as a remote Cascade Sensor. E. The company must buy a new Standard Cascade Profiler and can continue to use their Express but the two Cascade Profilers must be used independent of one another. F. The company can try to reduce the number of flows being seen by the Express. 15. In the traffic reporting tabs on Cascade Profiler, each report-by option has a default template that controls content and formatting of the resulting report. Which of the following is controlled by the default template? 16. What is one key benefit Cascade provides for Data Center Consolidation Projects? A. Ability to understand the response time of the Data Center as a whole. B. Ability to map out the inter-server dependencies between applications in the data center. C. Ability to map out the intra-server application/process dependencies on a server. A. Change the sampling time to process data after applying a View. B. See the granularity of a chart after applying a View. C. Define the sampling time before applying a View, and it will be the only one used to represent data. D. Increase the data granularity by reducing the size of the selected time window. 19. In the Cascade Profiler GUI, what best describes a Dashboard? A. A set of graphs showing top interfaces, top hosts, top users, and top protocols from which you can run reports. B. A configurable set of content blocks for watched and top items (items including hosts, network interfaces, ports, protocols, and applications), which are updated with current information and from which you can run reports. D. A configurable set of fixed logarithmic graphs for watched and top items (items including hosts, network interfaces, ports, protocols, and applications), which are updated with current information and from which you can run reports. 20. What is the maximum number of 10G ports that a Cascade Sensor can support?